NASA is developing the next generation of suit technologies that will enable deep space exploration by incorporating advancements such as regenerable carbon dioxide removal systems and water evaporation systems that more efficiently provide crew members with core necessities such as breathing air and temperature regulation. Mobility and fit of a pressurized suit are extremely important in keeping astronauts productive, so NASA is focusing on space suit designs to help crews work more efficiently and safely during spacewalks. NASA is evaluating pressurizable space suits for missions to a variety of exploration destinations. 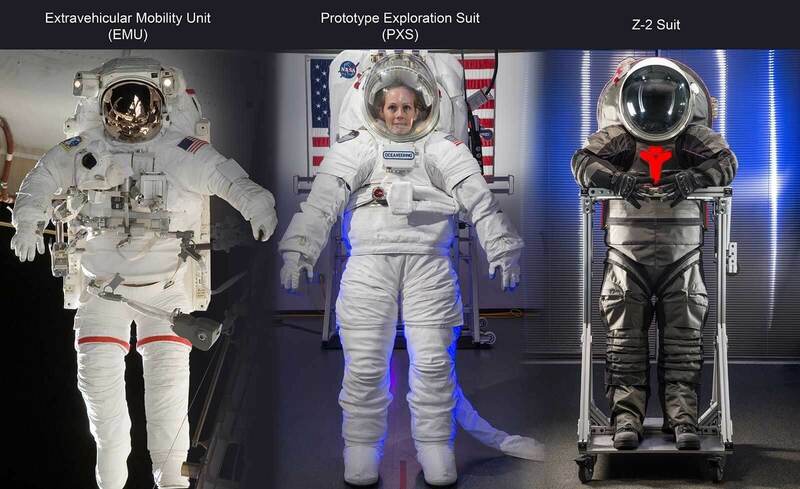 The EMU (operational spacesuit on ISS) is pictured above on the left, the PXS (advanced prototype) is in the middle and the Z2 (advanced prototype) is on the right. The Z-2 suit is a technology demonstrator for a planetary surface suit; the suit is designed for maximum astronaut productivity on a planetary surface – exploring, collecting samples, and maneuvering in and out of habitats and rovers. The Z-2 uses advanced composites to achieve a light-weight, high-durability suit that can withstand long-duration missions in the harsh environments found on Mars. Adjustable shoulder and waist sizing features maximize the range of crewmember sizes who can fit into any single suit. The PXS suit is a technology demonstrator focused on improving suit fit and performance while minimizing the amount of equipment required for long-duration missions to low-Earth orbit and beyond. The PXS uses a novel approach incorporating sizing features that could one day be 3-D printed on-orbit, in transit, or on Mars to achieve a customized fit for any crew member or change the orientation of bearings to optimize EVA mobility for different mission phases. Alien Woman On Mars Watching Rover From Hill? ?